Last night, a shocking 4-hour long video was posted to Facebook — of swarthy young males, some with their faces concealed by scarves, throwing rocks at, pushing against, and tearing down a metal border fence. Beginning at around the 3:07:00 mark, some of the invaders are carrying homemade shields, as if preparing to do battle. Beginning at the 3:10:00 mark is the sound of a helicopter. At the 3:11:26 mark, the low-flying helicopter can be seen. The helicopter hovers but does not land. At the 3:31:44 mark, one of the invaders throws a rock at the helicopter (and missed), followed by others also trying to hit the helicopter with rocks. By this time, the skyline is pink as daylight fades. As the dark of night encroaches, suddenly smoke (from tear gas?) is seen. Throughout the four-hour long video, you can hear the invaders yell and chatter. One word, intermittently uttered, stands out: “Americano”. 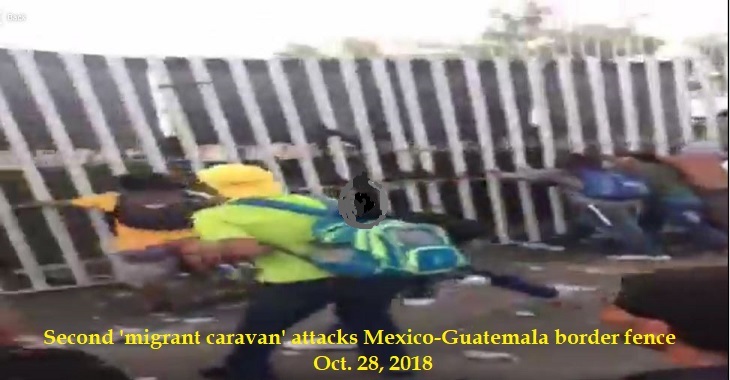 Below is a very short video of the invaders crashing the Mexico-Guatemala border. I urge you to watch the full video on Facebook or here, to get its full impact. El Informador, the person who posted the video to Facebook wrote in Spanish, “Second # Caravana Migrant collapses the border fence with Mexico. These are the people who are looking to enter the country,” but didn’t specify whether it’s the Mexico-Guatemala or Mexico-US border. 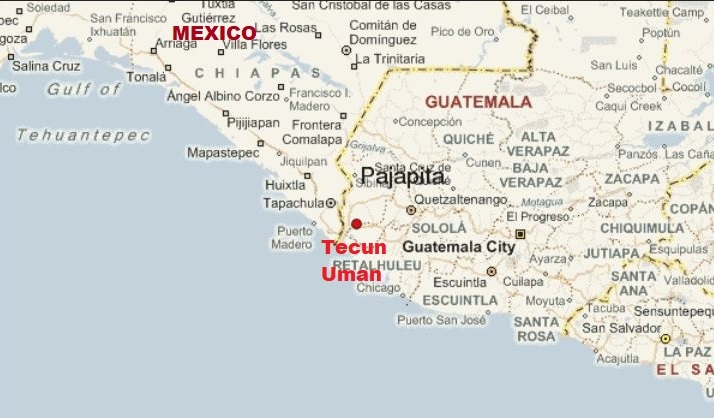 Citing the Associated Press, Jazz Shaw reports for Hot Air this morning that a second, smaller “caravan” out of Guatemala, consisting of several hundred “migrants”, stormed Mexico’s southern border in the Guatemala town of Tecun Uman and forced their way across. Some of the “migrants” were carrying rocks and bottles to throw at the police. Others were reportedly armed with guns and firebombs. One “migrant” was killed as Mexican police sought to hold them off, but reports differ as to who actually killed the man. The caravan arrived in sufficient numbers to eventually overwhelm the border security forces around the bridge and make it into Mexico. If they manage to catch up to the main body of the original caravan north of Tepanatepec they will no doubt blend into the massive crowd and disappear…. You’ve just seen how they smashed through the border and resorted to violence to achieve their goals on the border between Mexico and Guatemala. If and when they arrive at the American border, is it your opinion that they will quietly wait in line and stay in Mexican refugee camps while their requests for asylum or visas are systematically processed? President Trump and the Pentagon are preparing for violence when the “caravan” invaders, now numbering more than 14,000, reach the US-Mexico border. See “Operation Faithful Patriot: more than 5,200 U.S. troops deployed to secure US-Mexico border will be armed“. U.S. troops are heading to Mexico border! This entry was posted in conspiracy, Honduras-Guatemala 'caravan' invasion, illegal immigration, United States and tagged El Informador, Tecun Uman border clash, violent caravan migrants. Bookmark the permalink. Notice no other country is lining up to offer to take them. From something I read previously, the US troops being sent to our Southern Boarder will not be armed. What good is that going to do when opposed to an army of invaders who mask their identity, and threaten to kill or maim those who are manning the boarder? This kind of assault on our sovereignty is something we have never faced before. Truly, how can our country, or any country handle such masses of uneducated, non-English speaking thugs such as this? There is no doubt that we need to pray over this matter, that the Heaven’s intervene. I often hear about how these are “hard workers” who will take the jobs Americans are way too cool to work, so why don’t they get to work fixing up their own country. Five thousand (5,0090+) troops with no weapons? Will they also wear pink flowered uniforms and high heels and Trannies in tutus? They’ll be trampled by the invaders. And what is all this “posse comitatus” baloney? This is not a police action on U.S. soil .. this is about repelling an outside foreign invasion! Trump should pull us out of the 1951 UN refugee convention and stop this BS in its tracks. We should never have joined or allowed this evil, hateful, globalist, anti-American organization to occupy space here. Again, the purpose of this is to supersede national laws and establish a ‘right’ for anyone to “migrate” anywhere. They would call it a step toward Global Citizenry. I would call it “free range cattle”. Soon there will just be a Sanhedrin that controls the world. Won’t that be fun? Facebook’s Dilemma — their primary goal? Literally, Zuckerberg wanted to connect the entire planet as one. Do things without first worrying about breaking rules. The Arab Spring rebellions. Yeah, Tunisia, Egypt? Facebook. Then came the immense data collection and ad targeting. Then the data breaches and abuses, and the control of the “news”. And now we’re considering privacy rights, and who gets to censor who/what is allowed to post online. Too big to succeed (ethically/morally). Too successful (financially) to control. Are they the force behind globalism/socialism? Do NOT send the army if you do not intend to use them. Warn them that invaders will be shot if attempting to enter our country. Shoot a few dozen. That’ll stop it. So he’s going to build tent cities in the US for them? He wants to use the military to do this. He says 15,000. This may be the dumbest thing I’ve ever heard, and that statement has a lot of competition. They also discovered documents showing that the UN is funding a lot of this and is helping to coordinate it. So, he either knows this, or they’re doing it behind his back.